When I tell people I’m studying astrology or have an interest in it, I must concede that unless they have spoken with me extensively they have no idea what I’m talking about. Most people think astrology and the first thought that pops to mind is their daily weekly monthly horoscope. Which is completely understandable. People always say “my horoscope isn’t real” or “that isn’t the way they feel” or they tell me, “I know 4 other Gemini’s and none of them are like me” So I decided to explain what it is exactly that I do when I’m writing, reading and throwing out terms like natal chart and mercury retrograde. We are all made up of energy, everything around us, the air we breathe, the people we meet, this is the very reason why you can meet someone and in an instant decide you do not like them. Your energy fields do not jive (though sometimes rush to judgments are wrong) or if you are shopping and see someone in a hurry pushing their shopping cart like a lunatic, you feel their energy. They are in a rush; you know to get the hell out of their way. Just as we as humans are drawn to certain experiences like attracting like, if you are miserable…misery will always find you and if you are happy you attract abundance. The world on a larger scale also contains energy. This includes the 10 planets. For instance The Sun is a vibrant energy it is ruled by Leo think of any Leos you know, nothing stops them, they are happy and usually outgoing people. The moon contains emotional energy, ruled by Cancer the mother of zodiac it is nurturing and helpful and happiest when placed in Cancer, however the planets do not stay in the same sign 365 days a year. The moon for instances changes signs every 2.5 days being that the moon rules emotions you can notice that when the moon is in Aries an aggressive sign there will be more arguments and aggressive behavior. We absorb the atmospheres energy even on a grand scale. What is happening outwardly affects us inwardly. 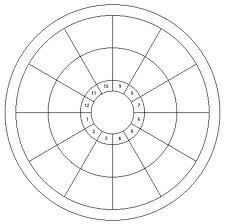 This blank chart is composed of 12 houses as per Wikipedia.com “The houses are divisions of the ecliptic plane (the path of the sun across the sky) as seen from the earth at the time and place of the horoscope in question. They are numbered counter-clockwise from the position of the eastern horizon (the cusp of the first house) at the time of the subject being charted”. The 4th house represents your upbringing, your home and your roots. So at the time you were born the planets were at a different point in the sky thus falling into a different area in your chart. Here is my chart at 7/7/77 at 10:15 pm. Aquarius is on my first house which is the face I show the world which is the reason I love Aquarians. Cancer Sun in 5th house, Moon in Aries in 2nd house, Mercury in Cancer in 3rd house, Venus in Gemini in 3rd house, Mars in Taurus 3rd house and so on and so forth. Leo is on the 7th house cusp which states in relationships I enjoy a partner I can admire, that tends to be possessive and bossy;) Ha! At 10:15 am I would have Virgo rising which would affect how I appear to the outside world and who I’m as an individual, Aquarius rising makes you unique and rebellious, Virgo rising indicates you are precise and plan oriented. Virgo rising follows rules. Aquarians do not! My Cancer Sun would no longer be in the 5th house enjoying love affairs, children and creative endeavors, but rather in the 11th house making me very passionate with friendships and group organizations, “a joiner”. Oh no no! Pisces on the 7th house cusp, indicating I like a partner with Piscerean traits. Two charts on the same day with the same Sun sign of Cancer with 2 totally different personalities this is why no two Cancers, Gemini’s, Pisces etc are alike. In relation to horoscopes I prefer yearly horoscopes; astrologers will study the planets especially the outer ones for the entire year. The further the planet the slower it moves around the zodiac. Take for instance Saturn. Saturn has been in Libra since 2009 and will remain there till sometime in 2012. Libra is the sign of partnership, Saturn is the father of the zodiac, Saturn’s energy has come to lay down the law and make sure you are giving 50/50. Uranus is the planet of revolution is now in Aries and will stay there till 2019!! The planet of rebellion in the sign of action in the astrological world has said to be the cause of the Middle East fighting for their freedom. It demands you wake up and start a revolution. This brings me to your horoscope, astrologers will study how these planets effect 1st your basic sun sign: I’m a cancer, cancer and Libra do not jive. We are square in the zodiac; there is friction there so someone writing a horoscope can safely assume I’m having a hard time with this. The sun represents my ego and Saturn is the father figure of the zodiac in poor aspect= trying times. Being that it is in Libra the sign of partnerships it will in a broad sense affect the way relate to other people. If you are writing a horoscope for an Aries and Uranus the planet of change is in Aries, same sign, like-minded easy exchange of energy you may write about how they are embarking on new worlds. Do you see how this works? Solar Return Charts: Please refer to my previous article on solar returns and the year ahead. Danielle, I really enjoyed that article – thank you. As a 12th house person, I think you are really brave to put your own chart online. I have had a look at it using the astro.com site and I have created a customised version that I think you might like. Could you tell me how I might send it you ? Pigeon post ?